Inspectors from the UN nuclear watchdog have been allowed to visit Iran's heavy water reactor at Arak for the first time since April. Iranian officials let the inspectors in as part of a deal struck with the International Atomic Energy Agency to discuss outstanding nuclear issues. Heavy water reactors produce plutonium, which can be used in nuclear weapons as an alternative to enriched uranium. Iran says its nuclear programme is for civilian purposes, not bomb-making. Located some 190km (120 miles) south-west of Tehran, the reactor has long been a bone of contention between Iran and the West. 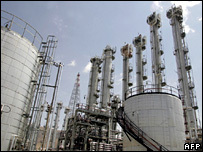 Arak was one of two Iranian nuclear facilities the existence of which was revealed by an exiled Iranian opposition group in 2002. At that stage Iran had failed to declare its existence to the IAEA. The project is scheduled to be completed by 2009. The IAEA also said it had agreed with Iran on the designation of new inspectors as well as how to deal with safeguards at the Natanz uranium enrichment plant.